When I was a little girl my family lived in Illinois for a short time. It was there that I became enamored with colorful autumn leaves and acorns. 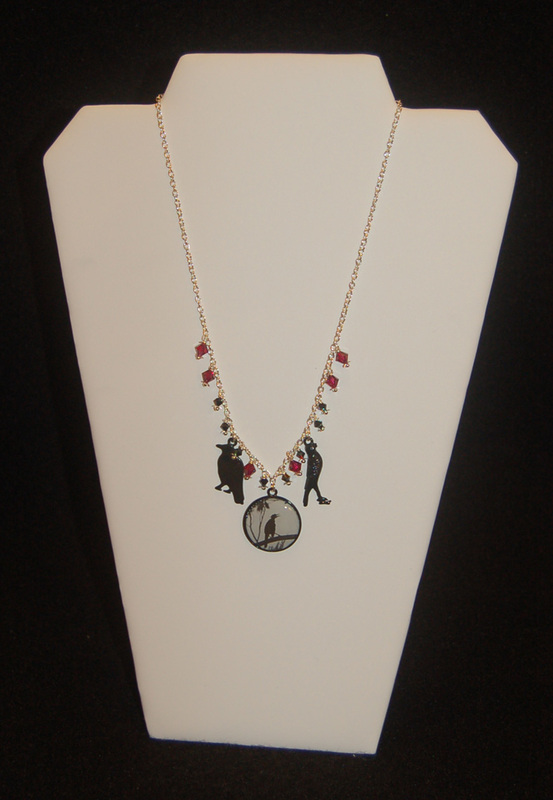 I made this necklace to celebrate my childhood memories and recent trip to the east coast. You can click on the photo if you want to see an enlargement. The photo doesn't show the true colors. 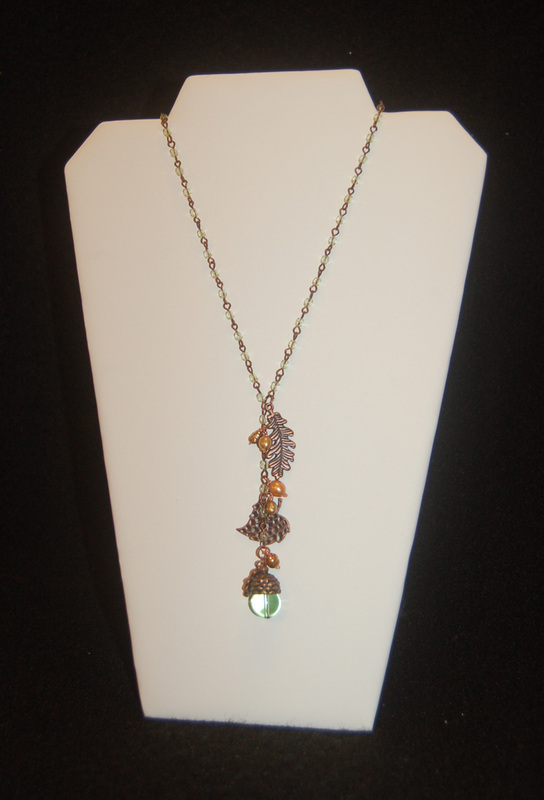 The glass acorn is actually a very nice olive green and the chain has matching green crystals. Copper was used for the findings because I love the warmth and earthy color....so autumnal. The copper leaf and acorn charms were a lucky find, but I'm sure if you really search you can find something similar at Ben Franklin Crafts, a thrift store (leaves are popular in jewelry), or you can try the bargain bin in a department store. 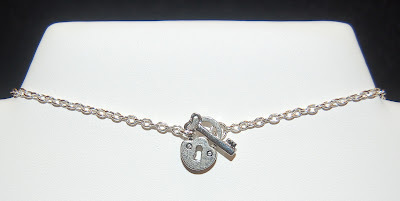 If you cannot find a chain with crystal links, you can fashion one yourself with beads and simple wire-wrapping work. I had a problem with the multi-colored pearls because their holes were too small to accomodate a copper head pin so I used a piece of copper wire and simply made a tiny scroll at the end to hold the pearl. Ben Franklin Crafts has strands of varied shaped fresh water pearls in many hues at a very low cost. If you decide to create a necklace like this one don't be overly concerned with making it an exact copy. Make it original....like you......one-of-a-kind. Remember, even though we don't really have an autumn season in Hawaii, we can enjoy the fall by crafting! As my Halloween crafting comes to an end and I move on to Thanksgiving, I thought I'd show you what I made after returning from last week's trip to the east and west coasts. The milk carton box with the scallop flap is a easily made with a Sizzix Pro Machine die and a 12x12 sheet of Bo Bunny cardstock. The window was made with a Nestible die and the cutout was used as the tag (embellished with a Bo Bunny sticker). 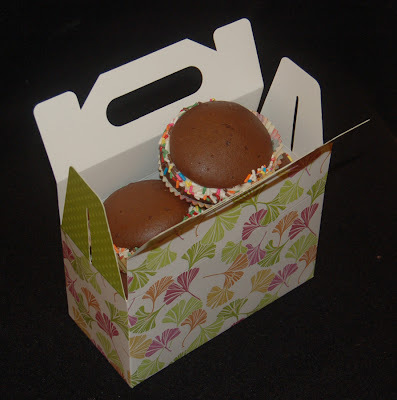 Inside the box are some homemade treats (see photo below) packaged in a cello treat bag. The other treat box is a recycled container with a sticker decorated cover. Actually, I had some trouble getting the original label removed so I decided just to cover it up. 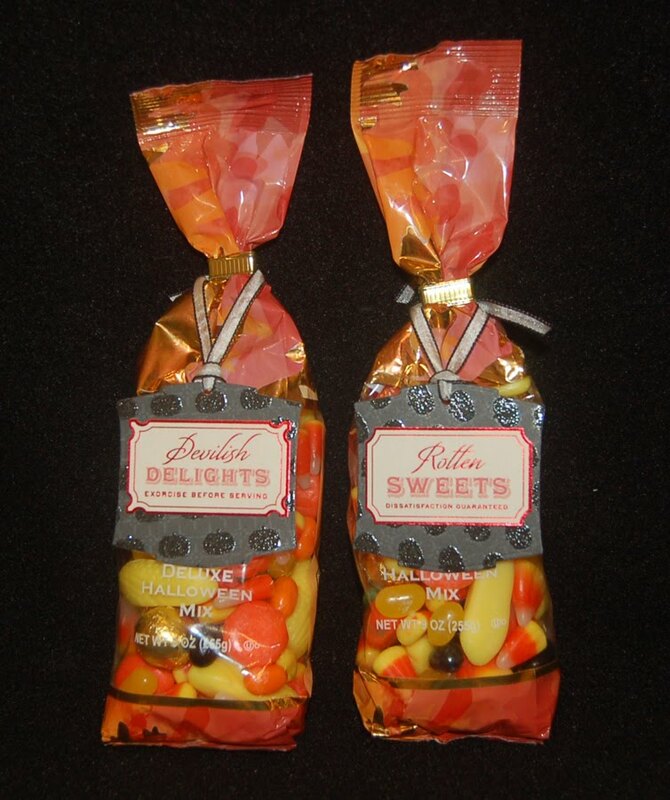 The two Jelly Belly bags of candy were instantly made more classy with the use of scrap paper cut with a Nestible and embellished with Martha Stewart candy label stickers. Here is what the treat boxes contain........dark chocolate dipped dried nectarines sprinkled with cashews. Using a Wilton chocolate melting pot (available at Ben Franklin Crafts), it's a snap to make these delicious and healthy treats. I hope you have the sweetest Halloween ever!!!!!! I was actually shopping for holiday items when I spotted these terrific new products. I love punches (as anyone who sees me shop knows) and so buying the EK Success cupcake border punch was a no-brainer because I also love cupcake designs. I have a cupcake birthday card in my mind just waiting for creation and I know the punched border will add the perfect touch. 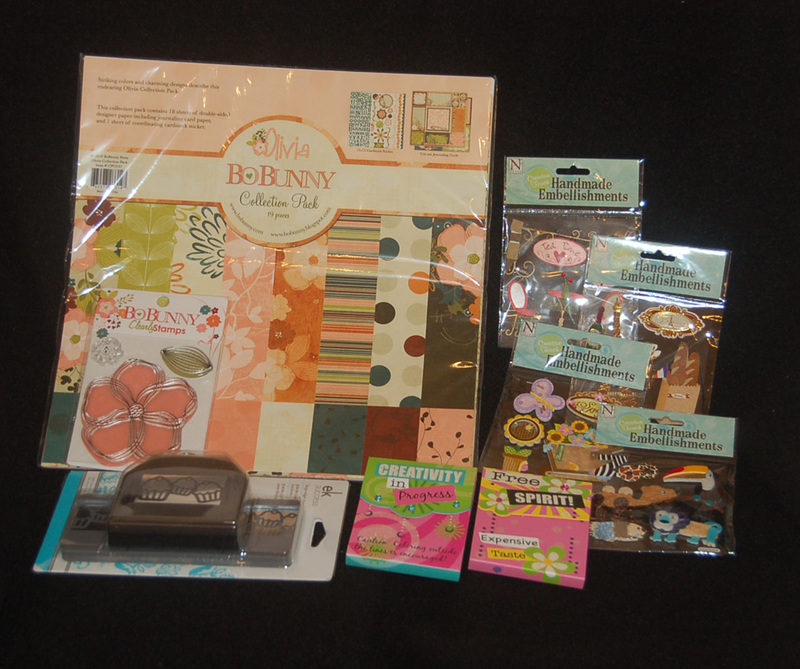 Like all paper crafters, I really don't NEED more paper but when I saw the Bo Bunny floral set and all the new items that match like the flower clear stamp in the photo, I knew that they would jump into my shopping basket. LOL! At least I resisted most of the embellishment (for now). The two little note pads in the photo are just a sample of the cute assortment now available at Ben Franklin Crafts. I particularly like these because of the sayings on the covers, colors, sparkle, and the fact the inside pages also have a matching design. I use these in my own bags and plan to include them (and a nice small pen) in all the purses I give for gifts. I'm a sticker collector and have been for decades (really, I'm that old). The stickers of today are fabulously intricate but often pricey. These from Nicole Crafts are priced at a thrifty $1.50 so you can afford to get handfuls of the themed packs. I chose the tea time, bakery, Paris, and zoo set...later I'll get the baby set to make a card and a beach pack for a scrapbook page. Yes, it is the holiday season so most of my purchases are for gifts or home decorating, but I still keep a crafty eye out for supplies I can use all year round. I hope that you'll shop at Ben Franklin crafts for your crafting needs and continue to read this blog to see what I've found at BFC that I just couldn't resist! Sometimes it's difficult to know what to give a crafter for Christmas because you don't know what she already has hidden away. Craft books are always a safe choice for gifts. Who doesn't want to learn more ways to make more beautiful stuff? At this particular time recycling is very popular because of the economy and the desire to keep the world green. The book, Craftcycle by Heidi Boyd is a clever publication which will show you how to turn old box game boards into trays, chip bags into a purse, soda cans into picture frames, fuse plastic bags into a tote or many, many other unique craft projects. Not only will you feel proud to recycle normally discarded items, the crafts you can make following the instructions are really useable and attractive. I know that I seem to always be showing you books about making cute stuffed creatures; here's another one. Bobby Dazzler's Make your Own Misfits is a sweet book that comes with patterns to make some lovable animals from discarded clothing. As you can see from the cover, the finished creatures have a Japanese toy look and although I haven't tried one yet, they seem simple to make. I know that someone on your Christmas list would love it if you made one for him/her. If you have a friend who is always searching flea markets for vintage linen, I think that you should give her this book. It is a Mary Englebreit publication and is filled with many sweet sewing projects. I especially love the stuffed giraffe, baker's apron, tea towels and baby bibs. Even though they have a vintage look, these project still look fresh because of the ME colors used. Receiving a book like this will inspire anyone to dust off the sewing machine and get back to sewing. The final item on my gift giving list is actually a magazine called GreenCraft by Somerset Studio. I think it is going to be a regular publication not just a special issue. Any recycler (even a beginner) would have fun making a shirtsleeve tote, felted sweater bag, computer part earrings, or broken plate jewelry. I'm sure that anyone who reads this magazine will start looking differently at what they throw into the trash, especially clothing. Why not give a friend a subscription? 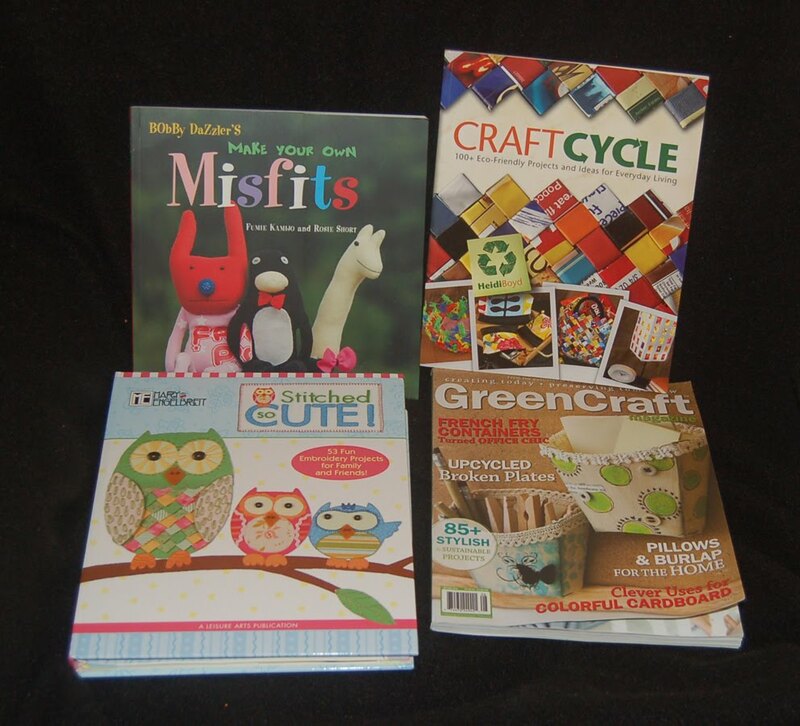 Craft books are fun to give and fun to receive. Treat yourself to one today and give some new inspiration to your work. Recycle and keep our planet clean! At first I was going to use this die for Christmas gifts because the finished CD holder is so cleverly folded and will hold money or a gift card, but I couldn't resist trying it out and then one thing led to another and I was decorating them for Halloween. They will hold a small amount of flat candies or gum. Also you may want to give out gift cards to fast food places which parents would appreciate instead of adding to their children's candy-overload. Another use for this die is to make secret pockets or journaling spaces for scrapbook pages. Wouldn't it look fabulous cut out of sparkly vellum with a photo folded inside as the center of a snowflake design? This die is my new favorite and another reason I am so happy I purchased the Pro Machine. Put the Sizzix Pro Machine on your wish list and you never know; Santa might be really generous this year if you've been a very good crafter. It wouldn't hurt to hint alot just in case you've been naughty. LOL! 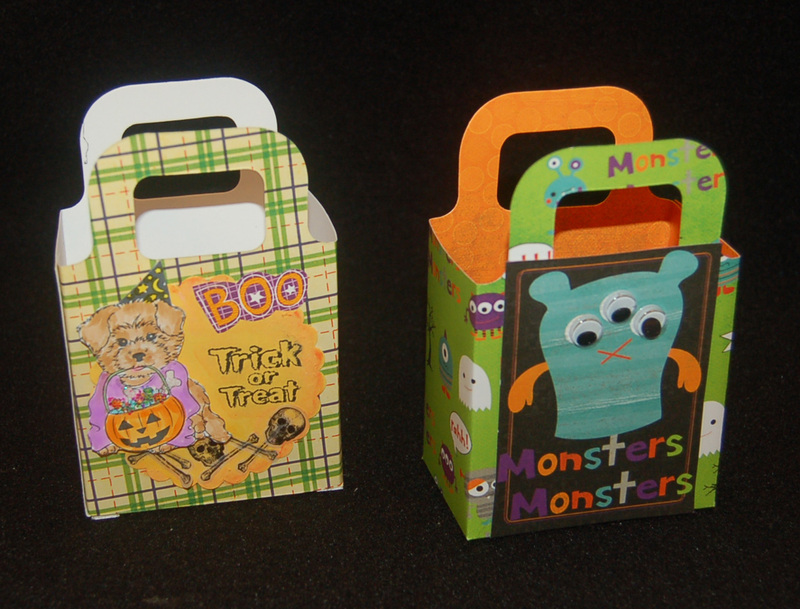 If you're faced with the dilemma of dozens of treat bags/boxes to make in a few hours, this is the project for you. 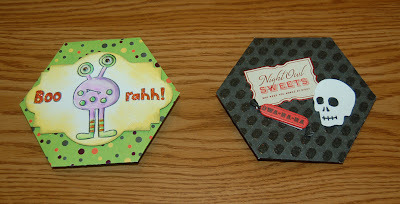 The box on the right is cut from Bo Bunny printed Halloween card stock using the Sizzix box w/handles Pro machine die. The front panel is just one of the rectangles cut from another sheet of Bo Bunny cardstock (there are about a dozen assorted design rectangles to a sheet). Googly eyes were added and the box assemble with a few strips of Merikan tape and it was done. The other box is a little more work (because of the coloring) but it was made to hold Halloween treats for a special dog friend. I learned that when you cut plaids with a die you should line up the paper so that the lines will not be tilting in the finished product (like mine). The stamp I used for the dog is from an Inkadinkado Halloween clear stamp set and the printed acetate skulls and bones are last year's Martha Stewart embellishments. (If you like something from the MS Halloween line, you need to get it this year because it most probably will not be available next year.) My sick sense of humor thought that the bones and skulls were funny to pair with the dog treat box. If you die cut treat containers (Ben Franklin Crafts lets you use their machine for free if you buy the paper) your work will be done in minutes and then you can have fun embellishing. 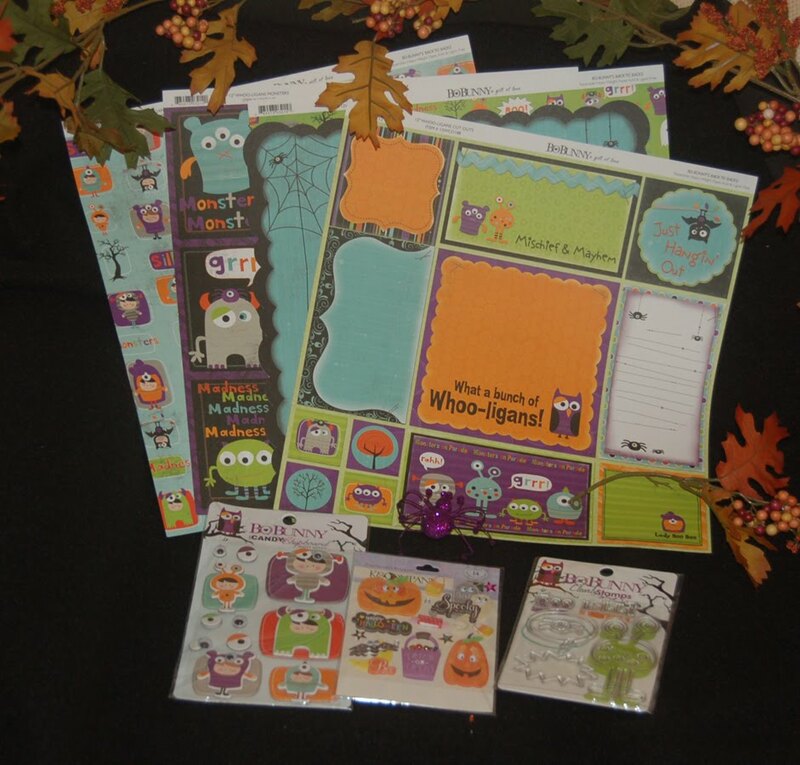 Your little monster friends will love the treats and be thrilled to receive such a pretty gift. necklaces pictured here were finished in an hour. The focal pieces (the ravens and spider) were bargain bin finds. The cord for the spider necklace is a rubber tubing but you could use leather. 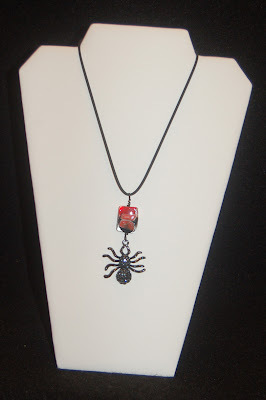 I used black Artistic Wire to wire wrap the bead and spider to the cord. 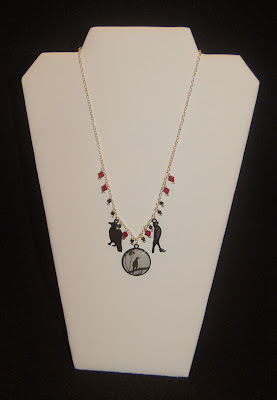 The bead and crystals on the necklaces help to give the pieces some sparkly blood red color. I search in garage sales and thrift store all year round for possible charms and pendants to use in my Halloween jewelry. Consider laminating Halloween stickers for bracelet charms or turning inexpensive Halloween themed metal buttons into pendants. Also by paying attention to details (notice the fun Blue Moon lock and key clasp) and keeping the colors Halloweenish (green and purple would be good, too) you will add to the charm of your spooky creation. Thank you for reading my blog. I hope it has been an enjoyable and inspirational stop in your blog surfing ride. This year some of Ben Franklin Crafts Halloween shipment arrived late. The Halloween products by Bo Bunny are extremely cute. Even if you already purchased Halloween craft items you're going to want some of these adorable stickers, papers, rubber stamps, and other embellishments. The only non-Bo Bunny item in the photo is the K and Co. dimensional stickers next to the rubber stamps. Notice the fall garland along the edges of the photo. BFC has lots of decorative garlands for the holidays. I think this one with acorns (which aren't in the photo) is especially attractive. I may wrap it around my staircase banister or wind it into a wreath. You may want to lay an autumnal garland down in the center of your Thanksgiving table....elegant and simple. More Halloween Boxes/ Where are you Berenice R.? Before I start writing about the Halloween boxes, I would like to know if anyone knows why Berenice R.hasn't claimed her prize yet. If you read this Berenice, please send us your mailing address (see last post) by Oct. 10th. Some of the Halloween boxes and bags at Ben Franklin Crafts are so cute and inexpensive that it doesn't make sense to die cut your own if you need multiple ones for your child's class or for party favors. 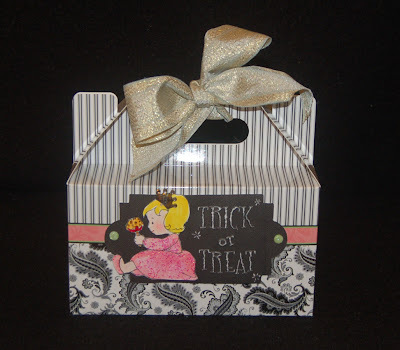 To satisfy your urge to create, why not just add some embellishments to the pre-made box. Here are a few samples that I made. The candy corn take-out box comes in two sizes. I used the smaller one and decorated it with an image (G Studio) stamped on a yellow circle with orange ink rubbed on the edges. Behind the circle is a punched web border topped with a single web punch out. The punches were from the Martha Stewart line. I used Fabri-Tac glue because it dries super fast and clear. Make sure that your embellishments (glued on the handle) still allow the metal handle to move freely or you won't be able to open the box. You don't have to fill this box with candy, rubber stamps and inks or make-up are good no-calorie options. 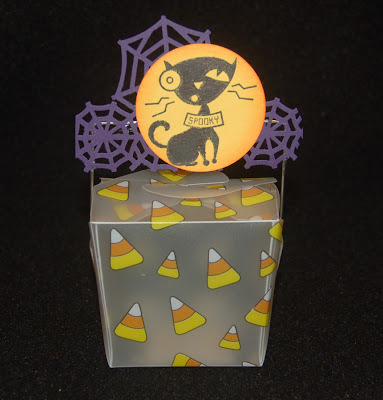 This not-really-Halloween box is a Nicole crafts product which is in the gift wrapping area of Ben Franklin Crafts. The black label is an altered Sizzix Frame Back Ornate #3 die. 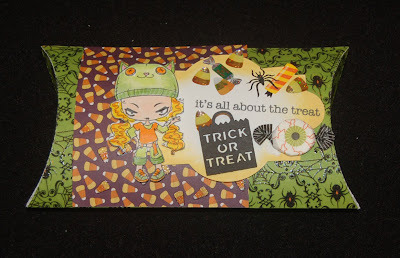 I cut off the top and bottom so that it would fit in the Sizzix Textured Impressions folder (Halloween set #2). The black label is a white core cardstock that was sanded lightly after impressing to bring out the words. Onto the label I added a CC Designs (Baby Tricks or Treets Princess) stamped (then colored and cut out). The box already had the pink printed ribbon and I embellished the Princess with a Darice rhinestone crown and MS glitter. Because I adhered the label with green sugar coated brads (Doodlebug Design Inc.), the recipient can change the label and regift the box (but hopefully, not the contents). Maybe the box will come back to you for a refill. LOL! 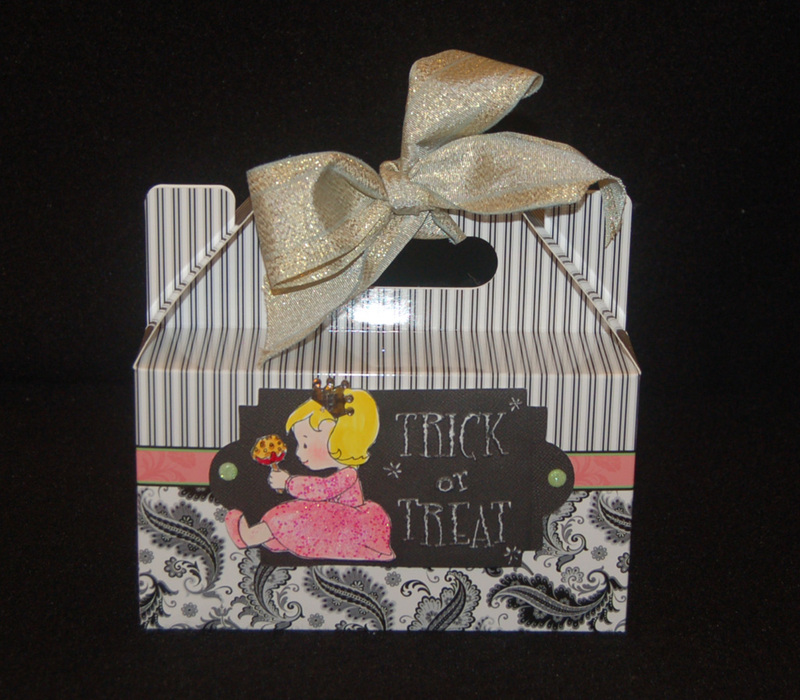 For Halloween this box could be filled with cookies, mini cupcakes or as the label suggests a candy apple. Nicole Crafts also has a lovely box with a ginko leaf design (see photo) which I couldn't resist filling with Whoppie Pies decorated with autumn-colored Wilton sprinkles. This was a thank you gift for our pet watchers. (One of our turtles is fat like a Whoppie Pie!) I think Whoppie Pies will be the cupcake fad of 2011. Yum-Yum get some! Congratulations to Bernice R.!!!!!!! 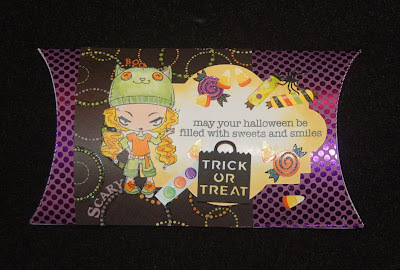 You are the winner of our Ben Franklin Craft Club Halloween blog candy giveaway! 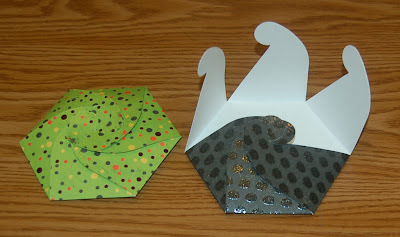 Bernice, please send your mailing address to contact@bfcraftclub.com to receive your prize. If we do not hear from you by Oct. 10th, we will choose another winner. Thank you to all who took the time to leave a comment and keep watching for future craft club contests. 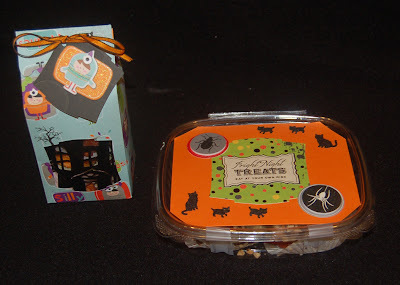 I wanted to make some fancy Halloween treat boxes and I wanted them to be big enough to hold lots of candy so I started with the Sizzix pillow box die and some shiny cardstock. Next, I wanted to use my The Greeting Farm rubber stamp (Thrusday) because she is so evil-looking but cute.....like a teenager. After stamping her (with waterproof ink) on white cardstock, I colored and cut her out. Then I used my Martha Stewart punch to make the black bag. (I love that punch!) After die cutting the label (Sizzix Frame Back Ornate #3), I rubbed the edges of the label with mustard Distress Ink and stamped a Hero Arts saying onto it. A scrap of fancy printed paper was adhered to the assembled box with double-stick Merikan tape. The inked label was also attached with Merikan tape and the cut out TGF image was added with pop-dots. Lastly, I decorated the box with lots of candy stickers (Jolee's, MS, etc. )to further dress it up. If you need to make a bunch of these for a party or the office gang, choose just one color scheme and work factory style. 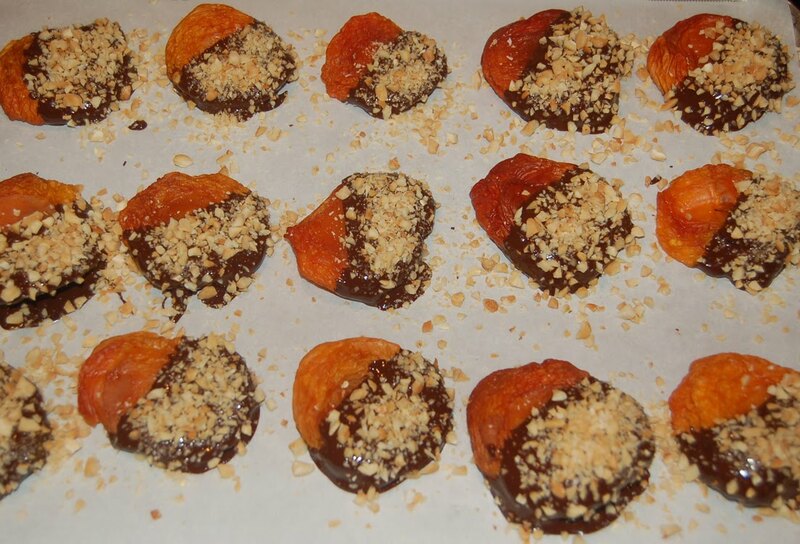 You'll be cranking them out by the dozens and your candy-loving friends will be so impress and thrilled. Thanks for stopping to read this post. Your comments are always welcome and appreciated.